Call for Buhari’s resignation, assault on Constitution –Presidency The Presidency on Monday described the call by some protesters for ailing President Muhammadu Buhari to return to the country or resign as an irrational assault on the nation’s constitution. 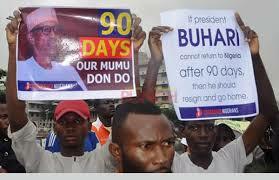 Shehu asked well-meaning members of the public to ignore the protesters who he said over-stepped their bounds. “Any such calls as being made by this or any other group represent an irrational assault on the constitution and should be ignored by well-meaning members of the public. “The government is busy with the reconstruction and rehabilitation of infrastructure all over the country. It is creating jobs for the unemployed. “It has set its sights on the larger picture of the country’s development; investing in rail and power projects and redeeming the country’s image from the mountains of corruption scandals that have marred it.